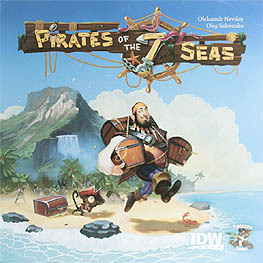 The design team behind the smash-hit Mysterium invites you to enter into unknown waters with Pirates of the Seven Seas! And they mean it, All Hands Ahoy, because this isn't you're average pirate game. In fact, it's unlike any board game. Take a turn for the topsy-turvy, where the top of this very tin serves as the board, your dice are your ships, and where they land on the board means as much as what you roll! Choose to remain an independent vagabond, or maybe cut a deal with a Governor to become all official-like in your pirating ways. Consult with a Shaman to curse the other pirates or pay a visit to the Cartographer to find a map with some hidden treasure. The Pirate with the most booty will win the day, but a Pirate's life isn't always on the up and up. Savvy?